The holidays can be very frustrating, especially when you lose track of all your holiday spending. It happens all the time. You’re at the store, you find the perfect gift for a few people, along with some decorations for your party and you forget about all these expenses later on. After the holiday season is over you’re still left with a pretty hefty bill. Don’t be left in the dark this year, use the Comprehensive Christmas Budget to have a convenient breakdown of your various holiday expenditures and receive an accurate account of your financial situation. Now you have the tools to make this year the best one yet! This document has everything you need on one tab. Go through each category and start filling out the required information. The “Gifts” section is where you will list everyone you want to buy a gift for. From the “Gifts” section, there is a column for your budget and the actual amount you have spent for the holidays. This Christmas Budget even provides the difference between these two figures, no more tiresome calculators. The other sections will be filled out the same way and provide you with the same calculation. There is a section to enter: gift wrapping supplies, postcards, decorations, food, and drinks. There will be a complete total in the very last row that is added from all the totals of each section. This information will also be provided for you at the top, for your convenience. Simply scroll back to the top after you have finished entering each item in your list to get a complete overview of all your information. At the top, there is a space that lets you know how many gifts have been purchased, your estimated budget, your actual amount spent, and the difference between these numbers. 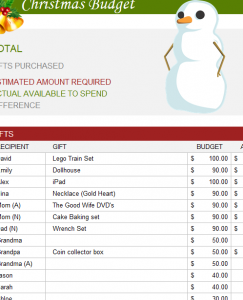 Now you can take control of the holidays by using this simple budget template!